MEDFIELD, Mass. -- The lights shut off in the first quarter of Tuesday's meeting between Medfield and Dover-Sherborn. As they returned to full power, Jack Cahill lit up the night. The Medfield senior exploded for two goals and four assists in the second half to power the Warriors to a convincing 14-8 win over their Tri Valley League rivals in the first ever Bruce Lerch Game of the Month. The highly-anticipated game benefited the Bruce Lerch Scholarship Fund, founded in honor of the late, great local sports reporter, who covered high school lacrosse for the Boston Herald and BostonLax. Cahill’s performance highlighted an all-around performance by the Medfield offensive unit. The Warriors had eight players score and had six assisted goal. Mark Nevins had three goals and an assist for Medfield (6-1). Owen Murphy and Kyle Keegan each had a pair of goals for the home team. Tied 4-4 at halftime, the Warriors offense found its groove in the final 24 minutes. Cahill scored 53 seconds into the third quarter and seemingly everything worked for the Warriors. The Warriors were able to work the ball around consistently and made the Raiders pay after long possessions. 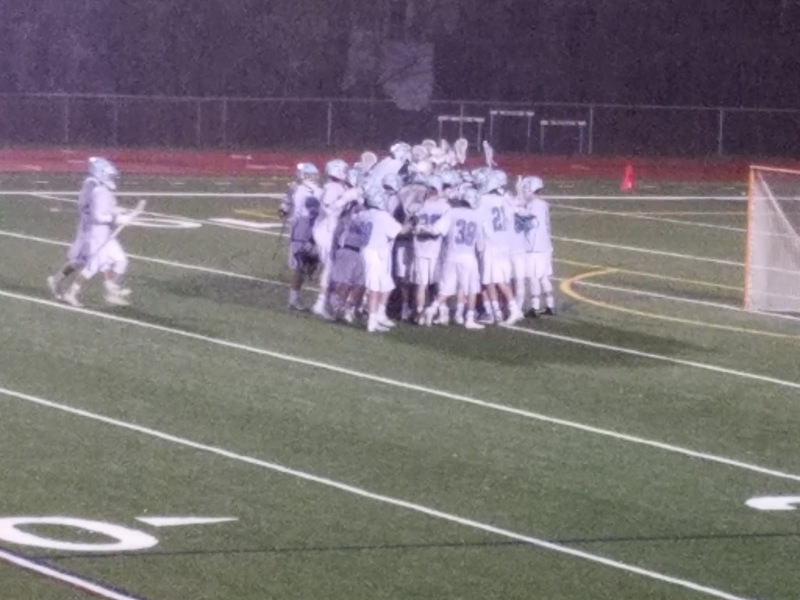 Medfield scored 10 goals on 18 shots in the second half. The Medfield offense worked and the defense was the engine that kept the good times rolling. With the three-headed monster of Bailey Laidman, Michael Mastrobuono, and Jack Mahoney wreaking havoc almost every time out, the Warrior defense took Mahoney and the North Carolina commit, Laidman, out of the game. Mahoney did score a goal in the third quarter but Laidman was totally shutdown. By directly shadowing him with short-stick midfielders for much of the game, with great defensive efforts especially by Tom Schofield and Trevor Ruzzo, Medfield held Laidman without a single shot on goal. With Laidman and Mahoney locked off, Mastrobuono did as much damage as he could for the Raiders (7-3) with four goals. The Raiders led by one goal three times in the first half but couldn’t keep it together due to turnovers. Despite winning ground balls 23-20, and faceoffs 15-11, the 20 turnovers by the Raiders did them in. The teams will face off again, in Dover, on May 17.